I Need Geography: What happens when plates collide? What happens when plates collide? 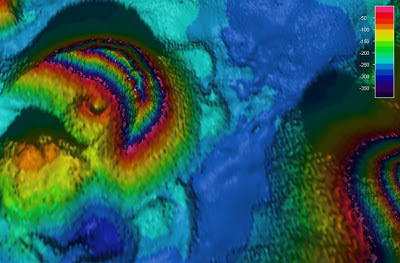 One of the newest volcanic vents discovered in Southeast Alaska is an underwater volcanic cone in Behm Canal near New Eddystone rock. "In the past three years, 12 new volcanoes have been discovered in Southeast Alaska, and 25 known volcanic vents and lava flows re-evaluated, thanks to dogged work by geologists with the U.S. Geological Survey (USGS) and the U.S. Forest Service. Sprinkled across hundreds of islands and fjords, most of the volcanic piles are tiny cones compared to the super-duper stratovolcanoes that parade off to the west, in the Aleutian Range." 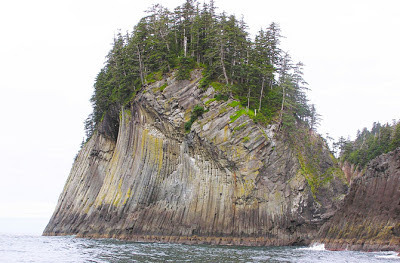 This spectacular columnar joint pattern in lava exposed in Alaska's Suemez Island formed when the lava flowed next to a glacier about 700,000 years ago. "But the Southeast's volcanoes are in a class by themselves, the researchers found. A chemical signature in the lava flows links them to a massive volcanic field in Canada. Unusual patterns in the lava also point to eruptions under, over and alongside glaciers, which could help scientists pinpoint the size of Alaska's mountain glaciers during past climate swings. "It's giving us this serendipitous window on the history of climate in Southeast Alaska for the last 1 million years," said Susan Karl, a research geologist with the USGS in Anchorage and the project's leader. "